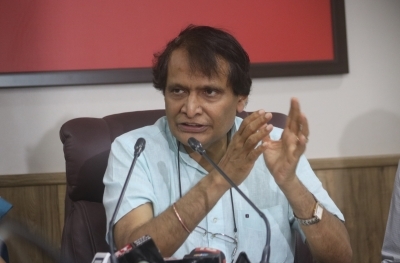 Bengaluru July 12 (IANS) India is keen on implementing the disruptive technologies of Artificial Intelligence (AI) for better governance Union Commerce and Industry Minister Suresh Prabhu said on Thursday. "India is keen to take AI as the thrust area and looks forward to implement AI in all governance and across the industry " Prabhu said addressing the 14th India Innovation Summit by the Confederation of Indian Industry (CII) through video conferencing. The central government will provide its support for the AI industry to build and maintain a start-up ecosystem that promotes innovation Prabhu added. The two-day CII summit from July 12-13 is being held with the theme India.AI - Driving the Future for the World with the participation of Indian industry and government officials. In a world that is continually evolving with disrupting technology Karnataka will leave no stone unturned in making the state future-ready the state s Information Technology and Biotechnology (IT&BT) Minister K.J. George said on the occasion. "The state is placing emphasis on training and capacity building. New talent development centres and incubation facilities are being set up in Mysuru Mangaluru Kalaburagi and Hubballi-Dharwad " George said. The governments must also make sure to allow the industry to try out AI-based applications in an environment that is safe and secure added the Chairman of India Innovation Summit and co-founder of software major Infosys Kris Gopalakrishnan. "AI will be good for the world provided the technology is used appropriately and this is where the government will have a role. We need to create a sand box for AI introduction in India so that we don t slow down progress while also ensuring regulations are in place " he said. India has the opportunity and the responsibility to lead the world in AI by educating and re-training its workforce he added. The summit will deliberate on topics like impact of AI on smart farming healthcare and the use of AI in learning automobiles and the like.